A concise, jargon-free guide to learning what Buddhist meditation is—and isn't—with advice on how to start a meditation practice. 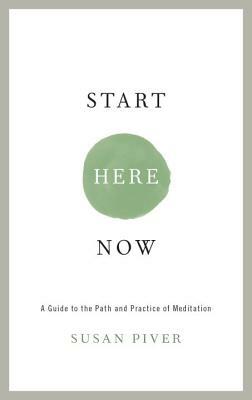 If you want to meditate but have no idea where to begin, this book by best-selling author and Buddhist teacher Susan Piver will help you: it contains everything you need to know to start a meditation practice and, even more important, to continue one. It defines what meditation is (and what it is not); dispels the three most common misconceptions about it; advises ways around obstacles; addresses the most frequently asked questions; and shows how meditation can have positive impact on relationships, creativity, and difficult emotions. However, Piver presents meditation as something more than the self-help technique du jour—it is a path to love, joy, and courage. This book contains two self-paced programs to help you start here—now! SUSAN PIVER is an author, meditation instructor, and founder of the virtual mindfulness community, the Open Heart Project. She has taught thousands of people how to meditate. Her books include How Not to Be Afraid of Your Own Life, The Wisdom of a Broken Heart, and the New York Times bestseller The Hard Questions. She has appeared on Oprah, The Today Show, The CBS Early Show, The Tyra Banks Show, and other national television programs in connection with her books. She leads workshops and retreats around the world. "I know you don’t have time to read this magical little book. That’s precisely why you need it—right now and forever. (When in doubt, see page 99)." "Susan Piver is the best meditation teacher I have ever heard. No kidding. All that meditation has made her mind crisp and clear and Start Here Now is far more than a transmission of great information; it is a transmission of clarity and love. "—Jennifer Louden, author, teacher, and founder of "Savor and Serve"